Terence Davies__ singular talent and style emerge over the course of these three short films. 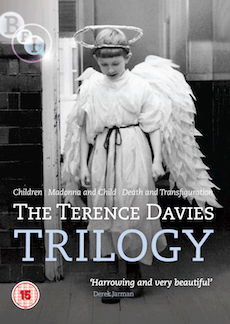 While at Coventry Drama School in the early 1970s, Terence Davies wrote the script for Children, which he directed in 1976. He subsequently took up a place at the National Film School and, with the support of the BFI Production Board, made his graduation film Madonna and Child (1980). Three years later, also part-funded by the BFI, he completed the Trilogy with Death and Transfiguration. The film has been restored by the BFI National Archive, who worked closely with Davies himself. Before Distant Voices, Still Lives (1988) and The Long Day Closes confirmed Terence Davies' status as one of the cinematic masters of our day, these three early shorts reveal a filmmaker of great promise. Full feature commentary by Terence Davies. Filmed interview with Terence Davies by Geoff Andrew. 10-page illustrated booklet including essays by Derek Jarman and Distant Voices, Still Lives producer Jennifer Howarth.